Carpet Roses are bred to eliminate the need for preventive chemical spraying or dusting. Count on its ultra-high natural disease resistance to defend it against black spot and mildew. Flower Carpet needs only a little basic care. 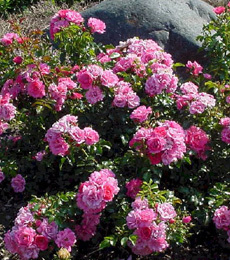 Roses need to be kept moist at all times to promote flowering. It can be planted out at any time of the year in any position around the house, from full sun to areas that receive only 3-4 hours of sun per day. The more sunlight there is, the more flowers each plant will produce.